This is a guest post from Bailey Harris, who writes for the Home Insurance Blog. If you like what you see here, be sure to stop by and check it out. Everyone knows that having an adequate insurance policy is a must for homeowners, but what if you rent? Many people overlook the value of a renter’s insurance policy, which can be a costly mistake. Renter’s insurance works a lot like homeowners insurance. It replaces your stuff if it is damaged or stolen and protects your assets in the event of an accident or catastrophe. If you have been wondering whether or not you need renter’s insurance, the answer is probably yes. Most renters’ belongings aren’t covered by the property owner’s insurance. You don’t want to be stuck with a lot of damaged property only to find out that your landlord’s insurance doesn’t apply to tenants. Don’t be afraid to ask your landlord if their insurance will cover you, and don’t be surprised when they tell you that you need to buy your own renter’s policy. Some landlords require tenants to carry insurance on their personal property. This is for the benefit of both parties and can save a lot of hassles down the line. If your rental unit is burglarized or burned to the ground, a renter’s policy will allow you to replace your stuff. Since it’s up to you to protect yourself, it’s in your best interest to buy a policy before disaster strikes. Whether you live in a high rise or a duplex, an accident or a thoughtless, careless neighbor could cost you everything you own. Maybe they’ll put burger on the grill and lose track of it, or maybe they’ll fall asleep with cigarette in their hand. The list goes on and on, and if you don’t take precautions you could lose it all and have nothing to show for it. Just like any other insurance policy, you have multiple options when it comes to choosing coverage, and the cost varies accordingly. If you’re the victim of a fire or a robbery, you’ll obviously want to make sure your belongings will be replaced. Beyond the above, special circumstances (e.g., flooding or hurricanes) require additional coverage that should be specified in your policy. 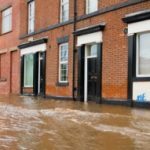 If you live in an area where those things could happen, you’ll need to make sure that you’re covered. You should also consider getting replacement cost coverage rather than just insuring the present value of your belongings. If that brand new 50″ HDTV is stolen or damaged beyond repair, you’ll want your insurance policy to replace it without a lot of out-of-pocket expense. To determine how much coverage you need, you’ll need to inventory your belongings. You might consider taking pictures or using a video camera to document what you own – just be sure to store these things somewhere other than your home. Once you have an idea of how much much coverage you need, contact your insurance agent to get an idea of the cost. Discuss your options, and don’t be afraid to pin them down to specifics. Find out exactly what coverage you’ll need under any foreseeable circumstance. Another thing to consider is that, if anything should happen to someone on your rented property, the injured party can come after you. A slip and fall in the kitchen could result in a financial nightmare. Make sure that your renter’s insurance policy offers some form of liability coverage. On the bright side, renter’s insurance is usually significantly less expensive than a homeowner’s insurance policy. 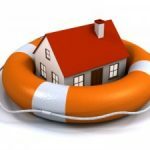 The reason for this is that you don’t need to insure the structure – the property owner’s policy takes care of that. So go ahead and shop around for the coverage you need. If disaster strikes, you’ll be glad you took the time to buy renter’s insurance. We’ve had a renter’s insurance policy for 14 years – costing us no more than $200 in any year – and we never had any reason to make a claim … until last year. The finished basement of the same house we’ve lived in all these years flooded, and damages to our property alone was in excess of $15,000. We lost some things in the flood that can never be replaced (priceless in terms of sentimental value), but thankfully with the insurance policy, we were able to replace furniture, appliances, books, etc. Get yourself a policy if you’re renting. It’s money well spent – it’s cheap, it gives you peace of mind no matter what, and it gives you coverage in case the unexpected happens. I purchased renter’s insurance three years ago after becoming a renter again when I had to make changes in my living situation. I shopped around and love the policy I obtained from Country Mutual. I’d be happy to share my agent’s info as he and the company had the best attitude and service of any that I dealt with, and I talked to several companies/agents via the phone. I feel my policy is a great buy and provides some peace of mind for less worry about “what if.” I highly recommend a good renter’s insurance policy. Everyone should have it if they own anything they’d have to pay for out of pocket which would be more than they can truly afford easily. 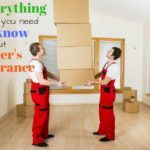 Renters Insurance has given me a huge relief from worry over my things/stuff. I live in a rural area and do not worry that much about theft, flood damage, or even fire. However for the price it was a no brainer. I am covered by the same company that I have car insurance with and I get a multi-line discount of 10% on my car insurance for also owning the renters insurance. With that kind of discount on my car insurance the renters insurance practically pays for itself. So for a minimal price I have coverage that covers me in the event that something does actually happen (which is what insurance is all about). For even lower rates, have a solid emergency fund and raise the price of the deductible. Definitely something worth looking into. Paying $110 in advance for a year of insurance feels like an unwanted expense but don’t ignore the low cost of coverage. Additional renter’s ins. lowers my car insurance payments. Real payment to protect my property is only a few dollars each month. Piece of mind to have coverage at a reasonable cost. Its certainly a good idea if you have possessions worth anything. 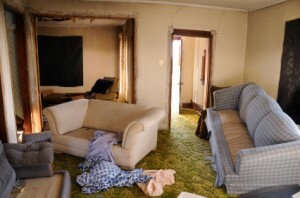 REnter’s property is NOT usually covered by the landlords insurance policy. If you get a renters policy with the insurance company that covers your auto insurance you may qualify for a discount. It is fairly inexpensive too. I think I paid around $100 a year for a renters policy before I bought my house but that was many years ago.